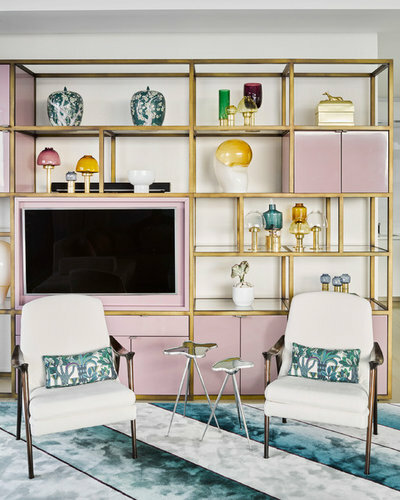 We are feeling the love this February and were inspired to share these “decorating with pink” design tips from Houzz‘s Lisa Baston Goldberg…. Pink is a bold choice when it comes to design, and it’s not for everyone. 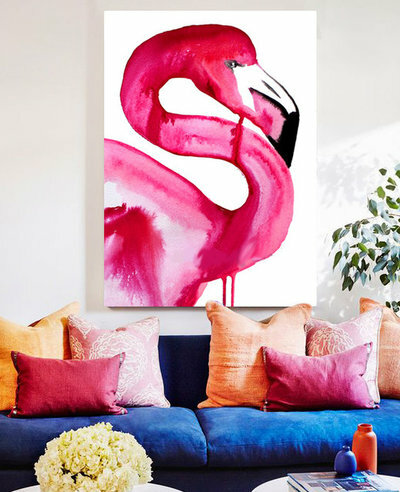 But for the color lovers among us, going with a powerful pink-inspired palette may be just what you need to infuse more vibrancy into your living space. Pink is happy. Pink is infectious. It can be bold or it can be soft, but regardless of the shade you pick, it’s sure to bring life and enjoyment into your home. That said, in my experience as a designer, I find that clients are cautious about incorporating pink. They not only worry that it’s too bold, but they’re also unsure what to pair it with. But fear no more. Here are five of my favorite colors to use with pink, and tons of inspirational images that rock the combos. Pink with black is one of my all-time favorite color pairings. Black is impactful and dramatic, and it can create lushness and depth when used with pink. Paired with pinks of any shade, black grounds and balances the energetic, happy feel that pink brings to a space. 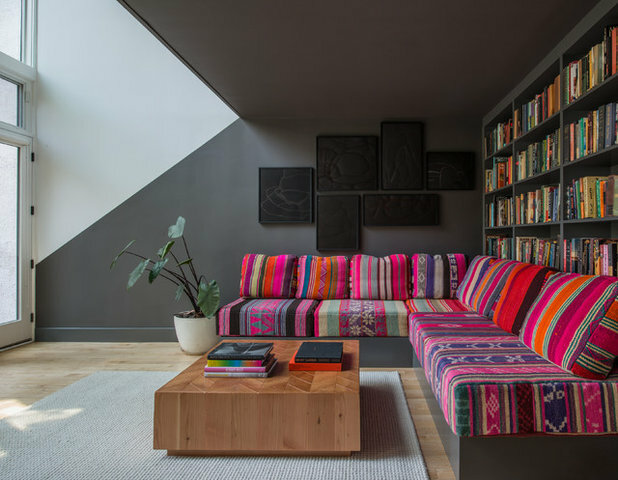 A hot and vibrant pink, like the one used on this sofa, might seem like a bold choice, but when you add in black, the room balances out. This is especially true in rooms that have a lot of other neutral pieces, as seen here. 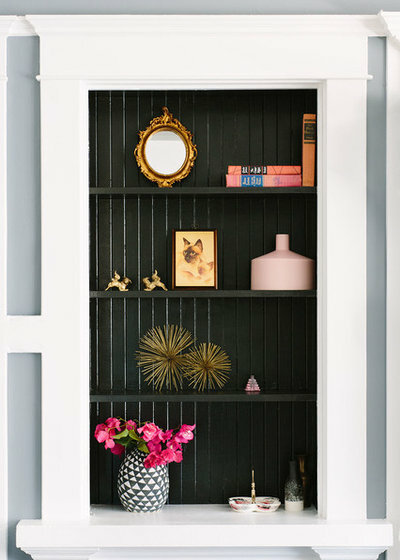 If you’re looking to give your neutral room a more vibrant look, a few touches of pink and black will do the trick. Softer shades of pink also pair well with black. Using black with lighter pink creates a beautiful balance of hard and soft, dark and light. 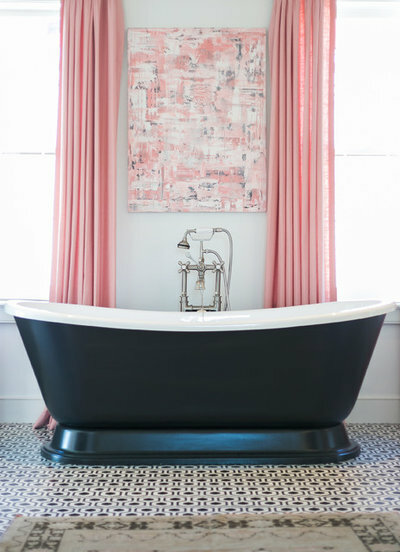 The soft curtains and art give this luxe black tub a light and airy feel. You don’t need a lot of pink to make an impact. Using pink flowers, for example, is an easy, beautiful and highly effective way to enliven a space with a dark or simple color palette. Flowers also allow the palette to be changed from week to week, making them the least expensive room makeover around. Textiles are another fairly easy element for introducing pink to a space. 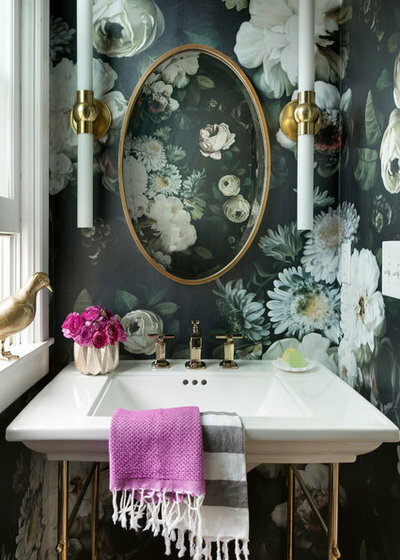 This predominantly black wallpaper is accented simply and beautifully with the addition of a pink towel and matching pink blooms. The feel is dark, lush and dramatic, yet also comfortable and fun. Conversely, adding a bit of black to a pink palette adds drama in an otherwise soft, calm space. The combination of pink and teal has come a long way in recent years. While in the past it often read as childish, today there are countless bold and beautiful ways these two color gems are being combined. The hotter the pink, the bigger the effect, and the same is true for teal. Using these bright, rich tones in an otherwise neutral space brings a room to life, making the space more fun. 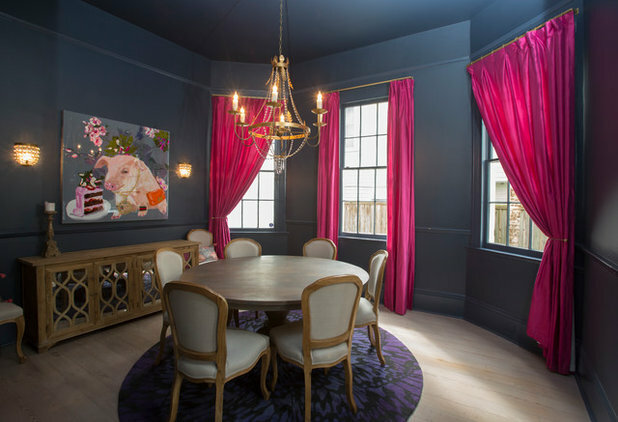 This homeowner opted to go with a vibrant pink on the walls and a statement-making teal chandelier in the middle of the room. The bold choices paid off with a space that’s energized and stunning. Softer shades do the reverse. Together, a soft pink and a cool teal create a relaxing, easygoing and whimsical room. Here, the teal grounds the design and the soft pink chairs and storage unit build on it. Pink looks good with muted shades such as gray, especially grays that are smooth, calm and neutral. Together, pink and gray create a welcoming and comfortable feel. Gray is a color (or rather a shade) that doesn’t make much of an impact on its own, which is why designers and homeowners often choose it. It’s great to build upon. If you have a predominantly white space, a few pink pillows on gray furniture will make the room more inviting. People will walk in and look toward the pillows and want to sit down and get comfy. Consider topping gray pieces in other rooms, such as the bedroom, with pink as well. 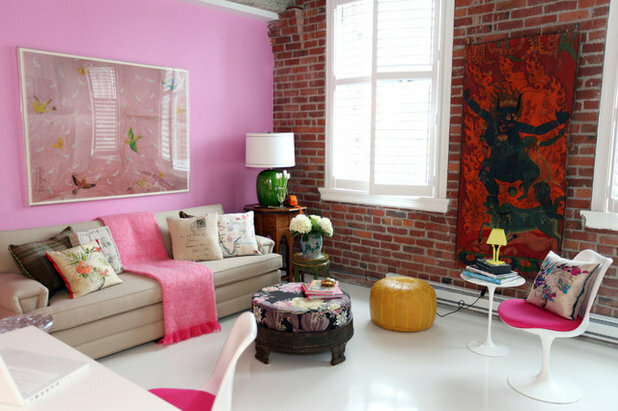 A couple of pink throw pillows can quickly change the look of a space, without requiring a long-term commitment. This bright and lovely bedroom gets its inviting feel from the mix of pink pillows, patterned fabric and striped gray wall. The whimsical artwork and little cactus on the side table don’t hurt either. 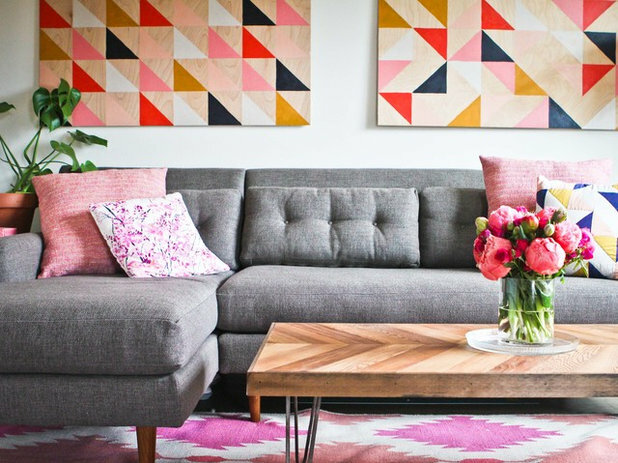 Beyond pillows, consider pink-patterned furniture. An overall gray room is a great place to mix things up and try new pieces. When it comes to color and design, I truly believe that anything goes. While you want to be sure to have an overall vision and color scheme for your space, I think we should feel free to mix and match what we like.Any colors can “go together” when curated in the right way, which is why I believe that (for the most part) clashing is a thing of the past. Pink with red is a perfect example of this. Pink and red are hot, bright and energetic tones that pack a punch when used together. While this bold pairing is not for everyone, when executed properly it creates an energizing space. 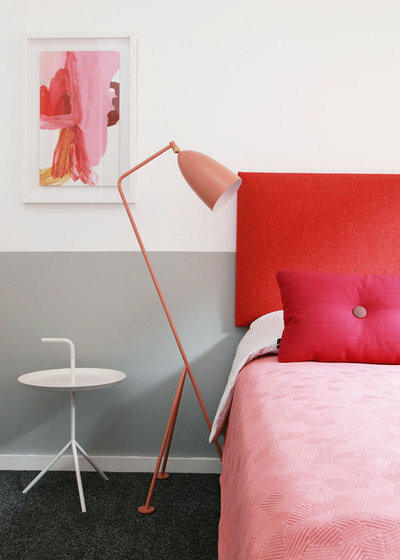 This bold pink-and-red bedroom has a playful yet luxurious feel. 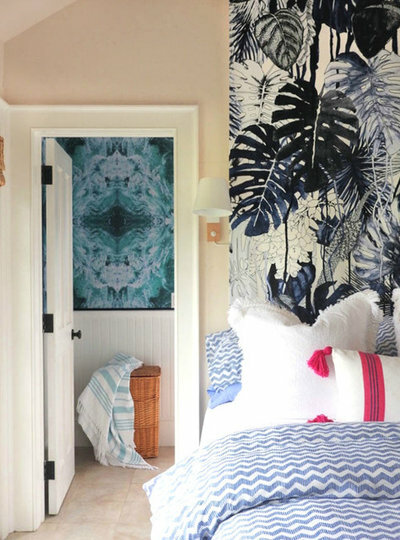 The fabric textures and patterns, along with the wallpaper, create a cheerful and stylish look. 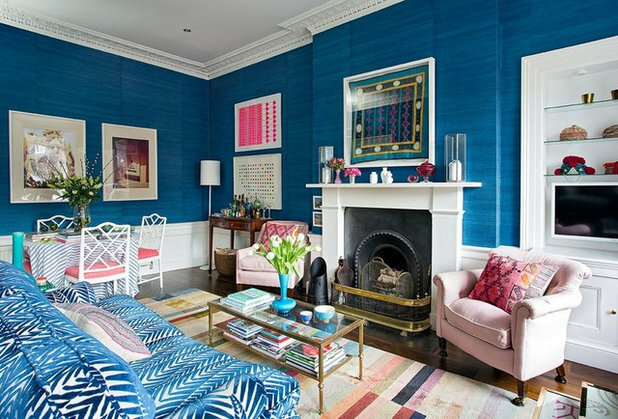 Any shades of pink and blue can be used in combination for a vibrant home space. Brighter tones of pink and blue have a powerful energizing effect. Deep and rich tones infuse a room with a lush, cozy feel. 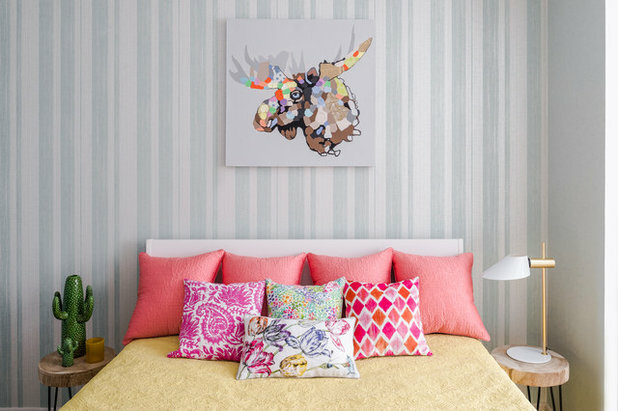 In a light or neutral space, pink and blue can unite on bedding, pillows, throws or art. 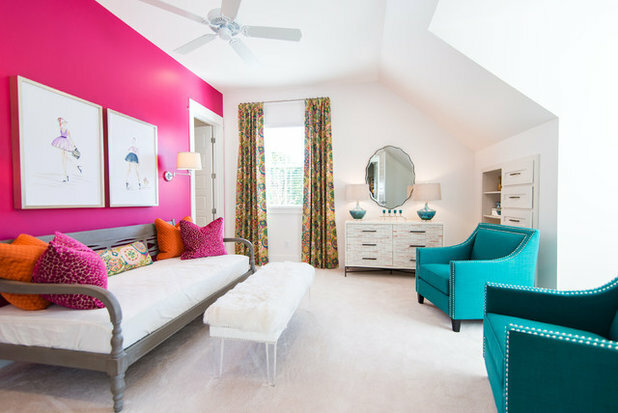 Pink and blue also mix well with other colors to create an even more colorful space. These vibrant blue chairs and the pink throw pillows make the room feel as happy as can be. 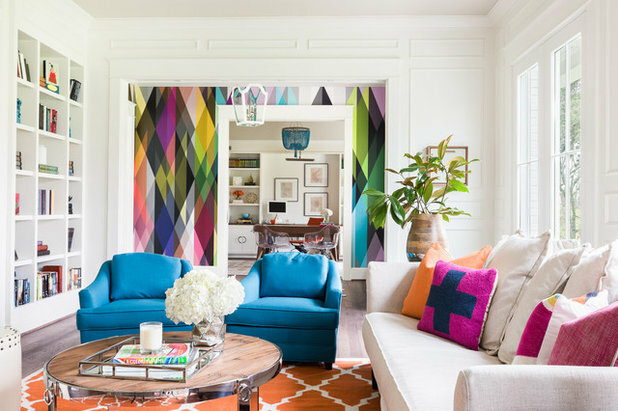 The designer expanded the palette by adding a multicolor geometric wallpaper and an orange rug.